Mount Desert Island, Maine was the third and final stop on the New England trip that we took this past fall. Although I didn't know it at the time, we visited there on the last weekend that everything was open for the season. 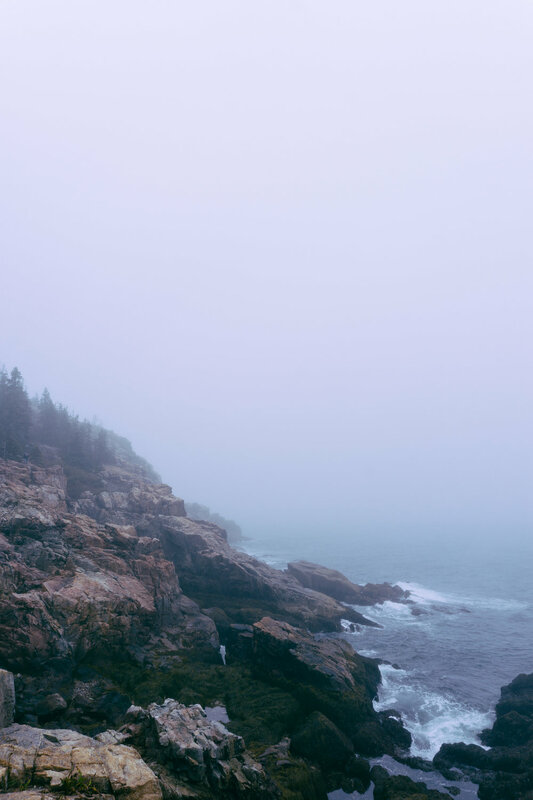 The weather was chilly and overcast for most of our stay, but it made the sights at Acadia National Park seem foreboding and magical. We had the best time exploring the island and savoring the final moments of the last trip we would take together before Linley arrives this February. This Airbnb - You guys know me - always an Airbnb. We stayed in this quaint little cottage, located just 5 minutes from Acadia National Park and 10 minutes from Bar Harbor. It was nice to be a little ways out of the hustle and bustle of Bar Harbor, yet still very accessible to town. The cottage was minimal, but it had everything we needed. I was super impressed by the shower situation - high pressure & lots of hot water, which is exactly what this preggo needed after a day spent on my feet at Acadia! We hoped to make a fire by Frenchman's Bay, but it was too windy on our last night (a good reason to come back). E A T / D R I N K.
2 Cats Inn & Cafe - We had brunch here our first morning before heading into a full day at the national park. Everything was fresh and full of flavor! Beal's Lobster Pier - The first time I ever ate lobster was fresh out of the water in Maine when I was about 7 years old. Can we say spoiled? ha! I haven't been to Maine since, so going to a lobster pound on the water was something I knew I wanted to do with Bobby. I didn't realize that most of the lobster pounds were closed on Sundays, which was the day we were planning to go, so I was thankful to come across Beal's. It just so happened that the day we went was the last day they were open for the season (another thing I didn't realize about lobster pounds)! We splurged on two huge lobsters and left feeling full and happy. Acadia National Park - We spent our first full day in Maine wandering through the beautiful Acadia National Park. There is so much to do there that it can be a little overwhelming to narrow down what you want to see the most. Through conversations with my mom (who has been before and is somewhat of a national park guru) and trusty Google/Pinterest searches, I decided on three places to focus on during our time in the park: Thunder Hole, Otter Cliffs & Jordan Pond. Thunder Hole is a naturally formed inlet that boasts a thundering sound when the right sized wave comes along. We spent most of our time exploring the cliffs and views adjacent to Thunder Hole. Bobby is a climber so it is hard to keep him off the rocks. 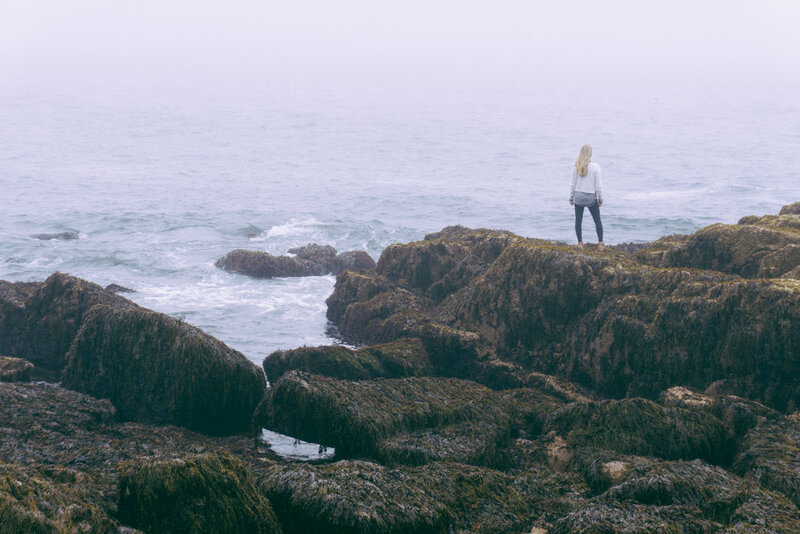 I'll never forget standing on the coastline on that foggy day, looking out into the Atlantic Ocean. After spending some time at Thunder Hole, we continued onto Otter Cliffs. There was a short hike to the cliffs. The trail was lined with the best smelling evergreens that had us both ready for Christmas long before it arrived. The view was outstanding. We ended our day in Acadia with another short hike at Jordan Pond. It can be a little confusing actually finding where the pond is because there is also a restaurant located there. I was set on walking along the wooden plank pathway that circled the pond. The gloominess of the day definitely added to the magic of the tree lined trail. Explore Bar Harbor - There is so much to see and do in Bar Harbor. We spent our time there window shopping, watching the Auburn/LSU football game at a local pub and checking out the grounds at Bar Harbor Inn. I do have to note that it was by far the most touristy stop in our New England trip, but we both still enjoyed ourselves. However, I was glad that I didn't focus too much on staying in Bar Harbor and was thankful that we checked out Southwest Harbor. If we go back, I'd definitely like to spend some time on the Cranberry Islands, located right off the coast of Southwest Harbor. Sailboat Cruise - We booked a 3 hour sailboat cruise that left from Southwest Harbor to see what Maine had to offer from the water. It was so relaxing and nice to be out on the bay. I definitely recommend doing some sort of water related excursion if you visit Mount Desert Island. Sail Acadia (the company we booked our sailing cruise through) also offers lobstering excursions that I think would make for a fun and unique experience.